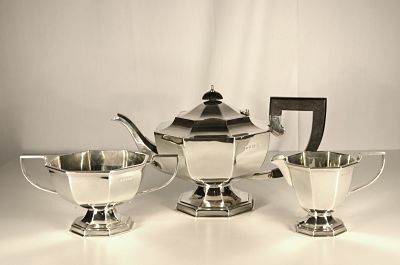 Sold inventory : An art deco sterling silver tea set. 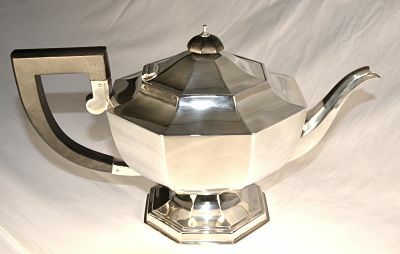 An art deco sterling silver tea set. There are three pieces: the tea pot being of plain octagonal form with hinged octagonal lid and wooden finial, raised on a spreading pedestal foot; the milk jug and sugar bowl are of similar design, but with gilded interiors and silver angled handles. The dimensions below are for the tea pot only. 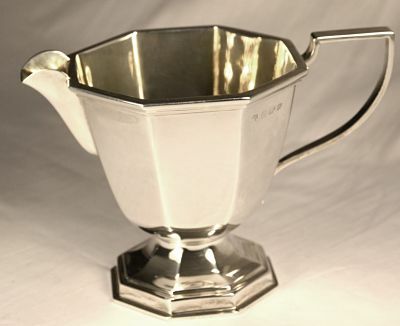 The milk jug weighs 6.7 ounces or 190 grams and measures 134 x 83 x 88 mm high (5.2 x 3.3 x 3.4 ins). 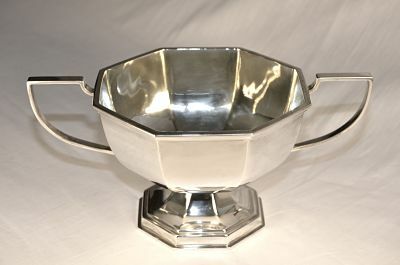 The sugar bowl 9.6 ounces or 271 gm and measures 195 x 120 x 88 mm high (7.7 x 4.8 x 3.4 ins). Full hallmarks are displayed on all pieces. The total weight of silver is 41 ounces or 1162 grams.